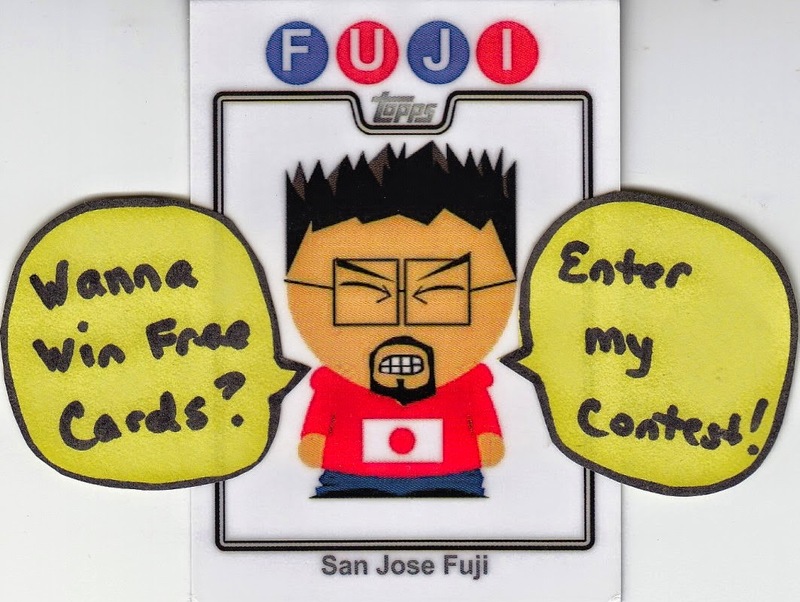 The other day Fuji hit his 1,000th blog post, a momentous occasion that has taken nearly 5 years, and to celebrate this special event he is holding a contest that will run for 1,000 hours or 41 days and 16 hours. The contest closes on Saturday June 7th, 2014 at 7 AM. To take part in the contest just visit his blog ( The Chronicles of Fuji) and follow the instructions. A story that touches the hearts of many Seahawks fans was the retirement of long-time Seahawk legend Marcus Trufant on Thursday April 24th. When it comes to the Seahawks Trufant was a home-grown star. He grew up in Tacoma, a mere 20 miles south of Century Link Field (and the Kingdom before that), he went to Washington State and was drafted by the Seahawks in 2003 and played his entire 10 year career in Seattle. After the 2012 season he signed with the Jacksonville Jaguars but was released before the season, he floated around with little interest and did not play in 2013. To ensure he will always be remembered as a Settle Seahawk the team signed him to a one-day deal so he could announce his retirement. I know it is not a big deal for most fans when a player retires but when you have a player who played a majority of their career in one location you like to see that player retire properly with the team they loved in the city who loved them. Some of the more notable athletes who have signed one-day contracts include both Roger Craig and Jerry Rice with the 49ers, Donovan McNabb with the Philadelphia Eagles, J.T. Snow with the San Francisco Giants and both Lance Berkman and Roy Oswalt signed one-day contracts with the Houston Astros earlier this month. Paul Pierce has also said that when it is time to retire he plans on signing a one-day contract with the Boston Celtics. Last night we lost an NFL legend with the passing of Earl Morrall at the age of 79, former QB for six different teams but most notable were his final two the Baltimore Colts and Miami Dolphins. What is a travesty is the limited coverage of his death, there is almost no mention of it besides a little blurb here or a photo gallery there. He may not be in the Hall of Fame but he won when the team needed him to win. In Baltimore he replaced the injured legend Johnny U and he lead the Colts to Super Bowl III, where they lost to the Jets, but two years later he replaced Johnny U after he was injured during Super Bowl V and won the game. A year later he went to the Dolphins where he replaced an injured Bob Griese and led the 1972 Dolphins to the only undefeated team in NFL history and another win in Super Bowl VII. A year later (again) he led the Dolphins to another win at Super Bowl VIII. So if you are counting that is three Super Bowl wins in four trips, the only undefeated team in NFL history (1972 Dolphins), the 1968 MVP and the 1972 Comeback Player of the Year. This was all after a rather successful college career at Michigan State where he played football and baseball and was the 1956 NFL Draft #2 pick by the 49ers. 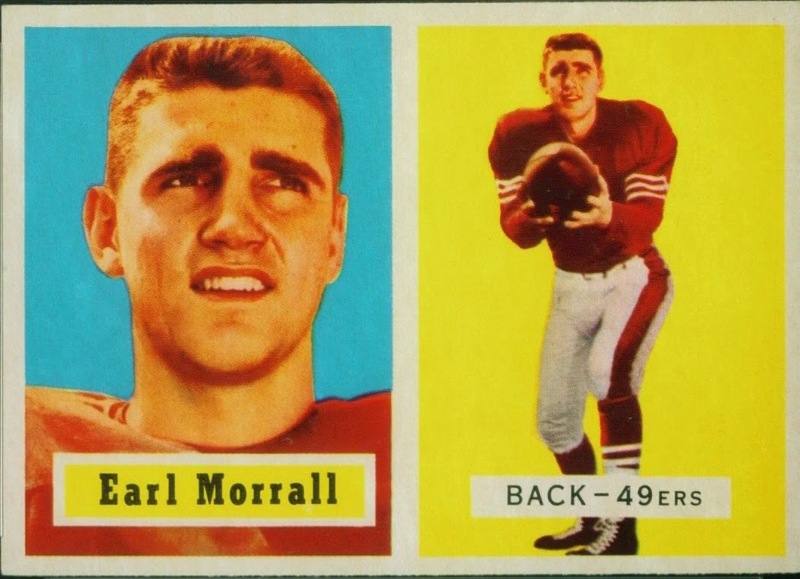 Morrall’s rookie card, 1957 Topps, can be found around $30-40 range and his autograph can still be picked for $10 or less. His autograph selection is pretty limited; 1997 Upper Deck Legends, 1999 Fleer Sports Illustrated, 1999 SP Signature Edition, 2000 Fleer Greats of the Game and 2005 Topps All-American. The 1999 Fleer Sports Illustrated seems to be the most common and to me seems like the nicest (and cheapest) option. 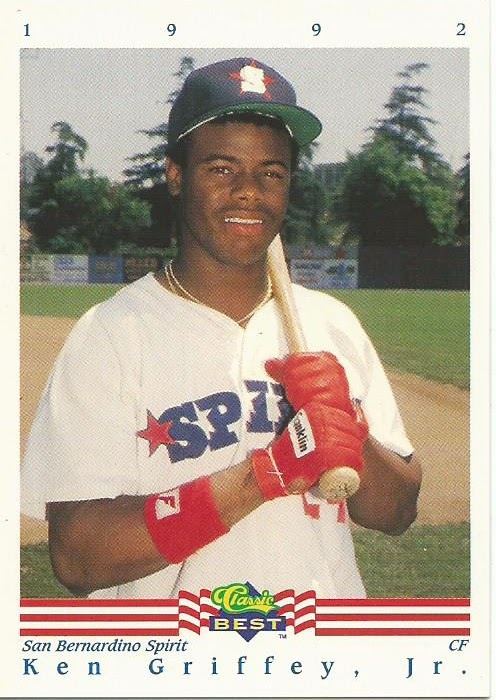 On Monday I came across an auction for a lot of 20 different Griffey cards, they were listed as 1989-2014 and the bid was only .99 cents so I tossed in a bid for $2.25 and waited. He only showed 14 cards in the pictures and his description listed only a couple of the cards that were already shown but there were three cards that I was actively hunting and if I could get all these cards for the price of a couple of the cards I was hunting I would be happy. In the end I did win with the $2.25 bid, toss in another $2.99 shipping and the package was shipped. I figured at $5.24 for 20 cards I was only paying .26 cents per card. Considering I do not have any local card shops and the nearest decent card show is 31 miles away I don’t get the chance to search through dime and quarter boxes to often. 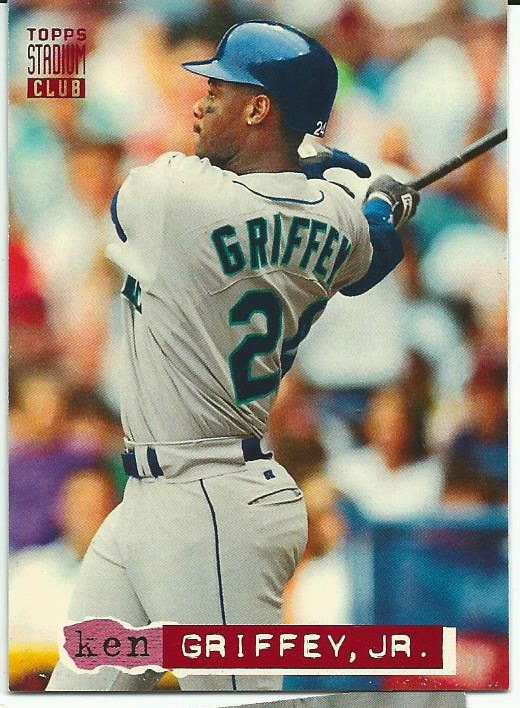 I got the padded envelope today and the dealer sent 20 Griffey cards plus a checklist (showing Griffey) and two cello packs of 1994 Post Cereal baseball cards for a total of 27 cards. All but three of the cards were from the 1990s, but that is ok because I needed all of them. 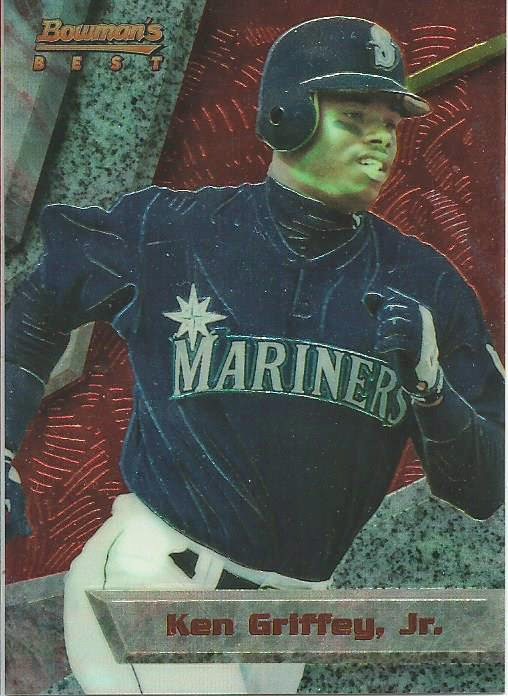 I also exercised another Griffey ghost, 1994 Stadium Club. In the end the price per card was only .19 cents. This was a very nice gesture from the seller, especially after I got the discolored Bowman Best cards last week, which that seller has offered to refund me completely. I sent the cards back to him on Tuesday so hopefully that works out. Here are some of the highlights from this pick up. In 1976 I was young lad living on Long Island, the upcoming Bicentennial had everyone is a frenzy of Americana. At the time Julius Erving was a member of the local ABA team, the New York Nets (playing out of Nassau Coliseum), which went on to win the final ABA Title in 1976 prior to the ABA-NBA merger. After the merger Dr. J. went on to join the Philadelphia 76ers, where he won another title in 1983. 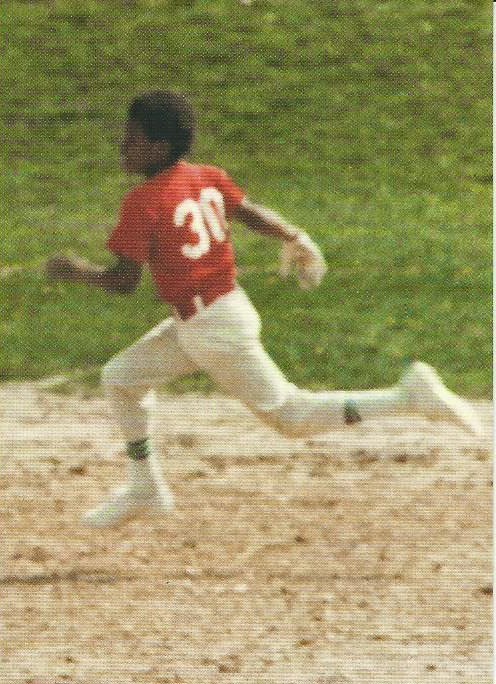 As you grow up you will occasionally link a specific person to a time or a place and with me Dr. J represents the Bicentennial. 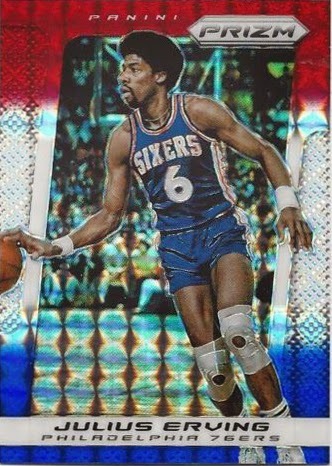 I honestly cannot explain why I connect him to 1976, possibly because he won the title in 1976 or that he played for the 76ers, but this 2013-14 Panini Prizm Erving Red, White and Blue parallel really appeals to me. It just brings me back to when I was a kid and would watch his amazing dunks. I don’t have one yet, I keep putting it off, I need to quit waiting and add this pure sweetness to my personal collection. 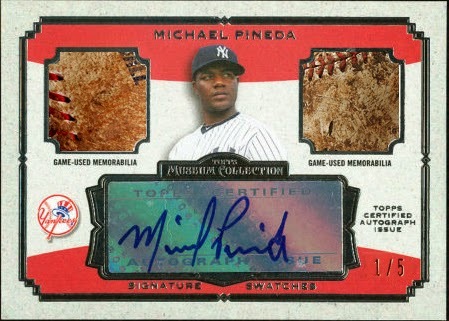 Michael Pineda obviously did not learn after being accused of using pine tar while pitching back on April 10th. He needs to watch Major League and learn proper placement of foreign substances from Eddie Harris (Chelcie Ross). This seemed like an appropriate time for me to create a new pine tar What If? card. Hopefully this is a learning experience for Pineda because he really is a solid pitcher with a decent career ahead of him. 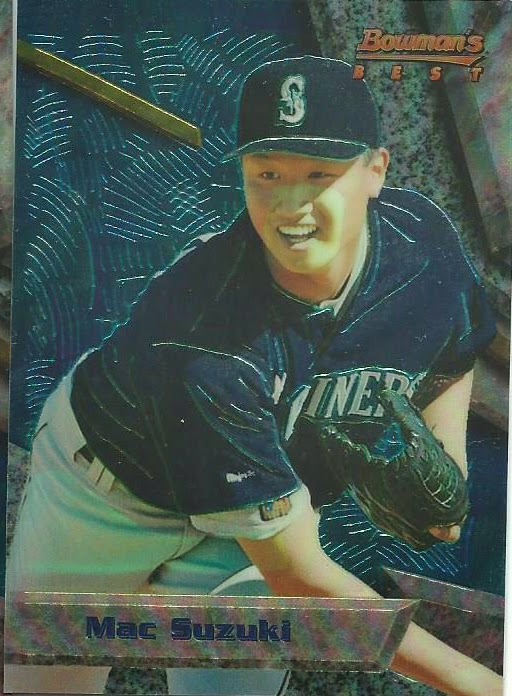 I watched this kid come up through the Mariners system and was very disappointed when he was traded to the Yankees for Jesus Montero and Hector Noesi, a horrible trade. Montero was a solid prospect, before hitting a streak of bad luck, had only played 29 games last year (with a .208 avg) before getting hurt in June and then to add insult to injury he was suspended 50 games for his involvement in the Biogenesis scandal. He showed up this year at Spring Training 40 pounds overweight, is currently playing for the Mariners Triple-A team in Tacoma. Noesi was a complete failure, he pitched in 36 games for the Mariners between 2012-2014 going 2-14. His lowest ERA in Seattle was 5.82 in 2012. He was traded to the Texas Rangers 11 days ago (I am pretty sure it was for a used washing machine) and yesterday they designated him for assignment (the second time in two weeks). Oakland, which has the #5 pick. A team in need of a QB, not a bad card to get. Currently there are no Oakland cards up for auction. The back of the card just has the redemption information, the expiration date is August 8, 2014. I wonder why it is such a short redemption period. 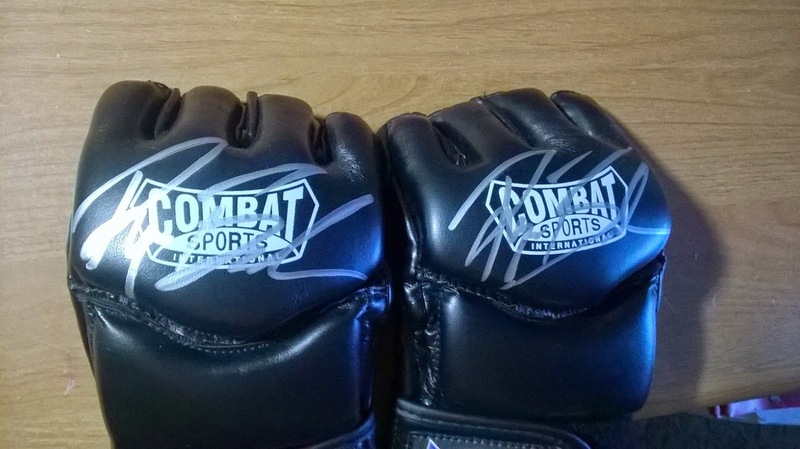 My son trains at Power MMA, a gym owned by UFC fighters Ryan Bader and CB Dollaway, and knowing that Bader is my favorite fighter he asked him to sign some fighting gloves. Ryan signed two gloves, one for me and the other for my son. My son surprised me with the glove yesterday morning, talk about an amazing present. The gloves are actually my son’s training gloves, which I now have to be replaced, but I am quite alright with that in this case. 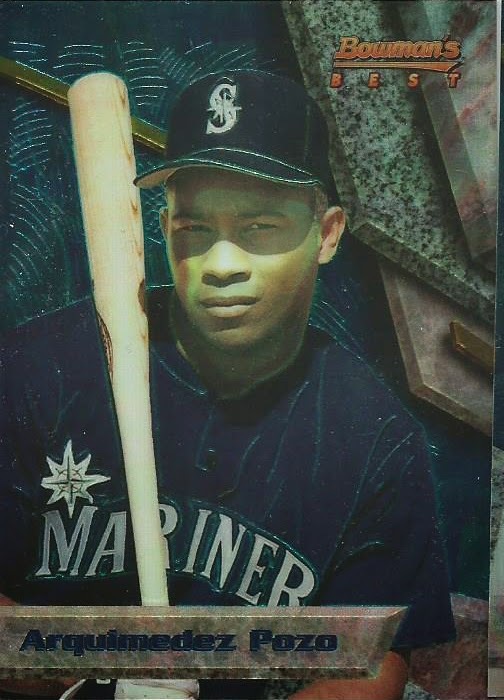 I was looking to add a 1994 Bowman’s Best Griffey card to my collection and I came across a seller offering a four card Mariners set (Griffey, Buhner, Pozo and Mac Suzuki) for $2.25 plus an additional $2 shipping, he had two sets available. Here is the actual auction. 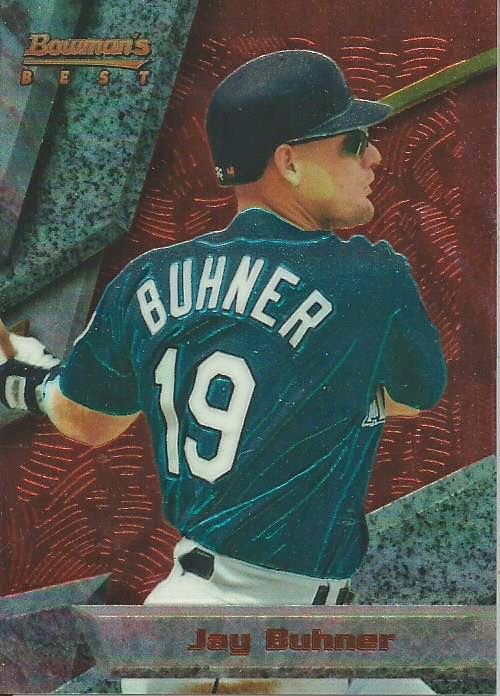 The Griffey card was my main target but I am always happy to add a Buhner card to my Mariners collection and the price was right. 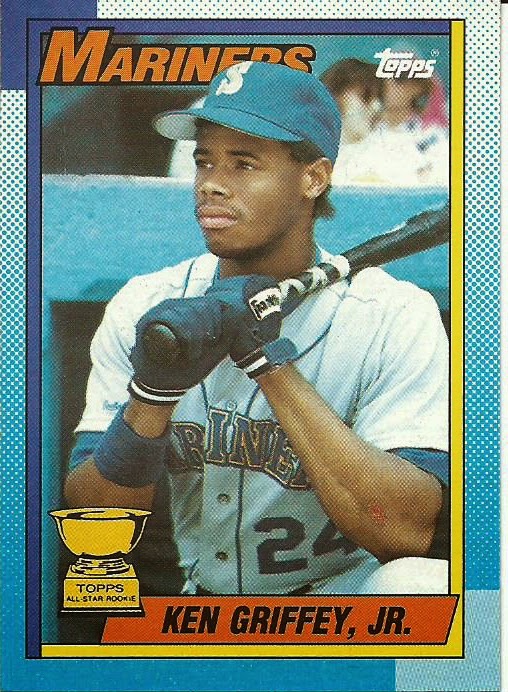 Only the Griffey card was shown but the listing said all cards were averaged NrMt. I received the cards today and all four cards are noticeably discolored, something I would not list as NrMt. Unfortunately chrome, foil and Finest cards are susceptible to damage like this when they are stored together without penny sleeves for an extended time due to the coating. 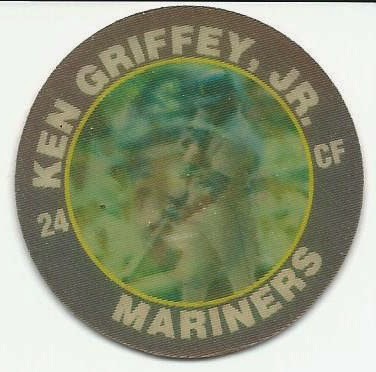 When I pulled these cards from the envelope they were in a penny sleeve together with the Suzuki and Pozo cards stuck together to the back of the Griffey card. I am upset, had it been listed as “Discolored” or “Damaged” I would have either passed or inquired about the severity of damage. I just emailed the seller to see if he can replace the cards, I am holding off on posting feedback for now. The guy has 100% with nearly 15,000 feedback and I don’t want to ding him if he is willing to replace the cards (at least the Griffey and Buhner cards). I enjoy the show Modern Family and one of our local channels shows reruns 5 times a week. Last night’s episode included two of my favorite things, Christmas and sports cards. The episode, Express Christmas, included a variety of hijinks but it was Phil’s (Ty Burrell) attempt to impress his father-in-law Jay (Ed O’Neill) that made me chuckle. I think many of us can relate to damaging a card on accident, though not to Phil’s extent. I could only find one, blurry video with the part where he damages the card but it is still funny. 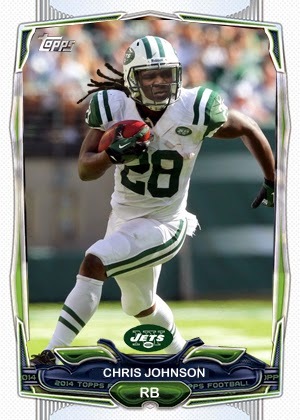 Last Friday I asked if there was still room for Chris Johnson in the NFL and the New York Jets answered that question by signing him to a 2-year deal worth up to $9 million. He is making half of what he was making in Tennessee and he will be working alongside Bilal Powell (697 rushing yards in 2013) and Chris Ivory (833 rushing yards in 2013) as part of a running back by committee tandem but he will probably be happier working with the Jets. Now with the young Geno Smith and veteran Vick at QB opportunities may open up for the running game, the addition of Eric Decker also gives the team a solid wide receiver to open up the box too. Additional news out of Seattle, Sidney Rice has resigned with the Seahawks for a 1-year deal. 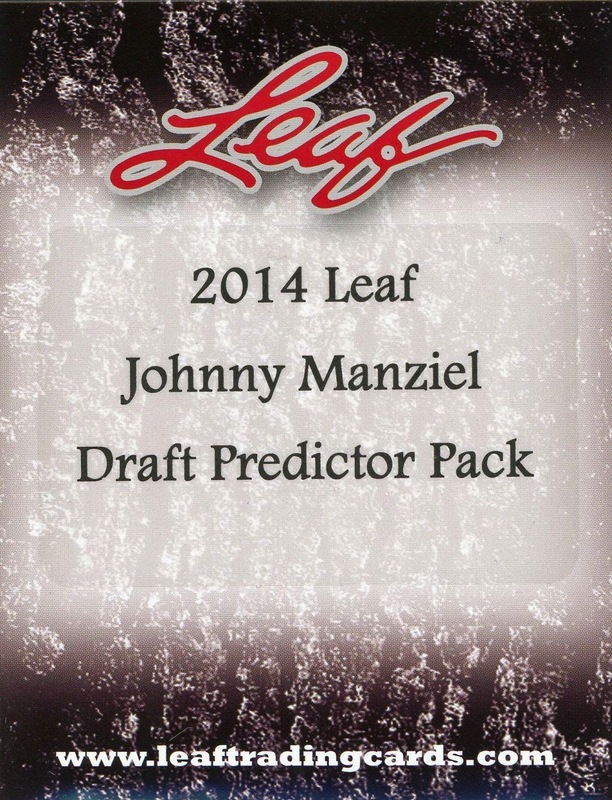 Building on the hype of “Johnny Football”, Leaf has announced the release of a special draft predictor set, 2014 Leaf Johnny Manziel Predictor Packs. 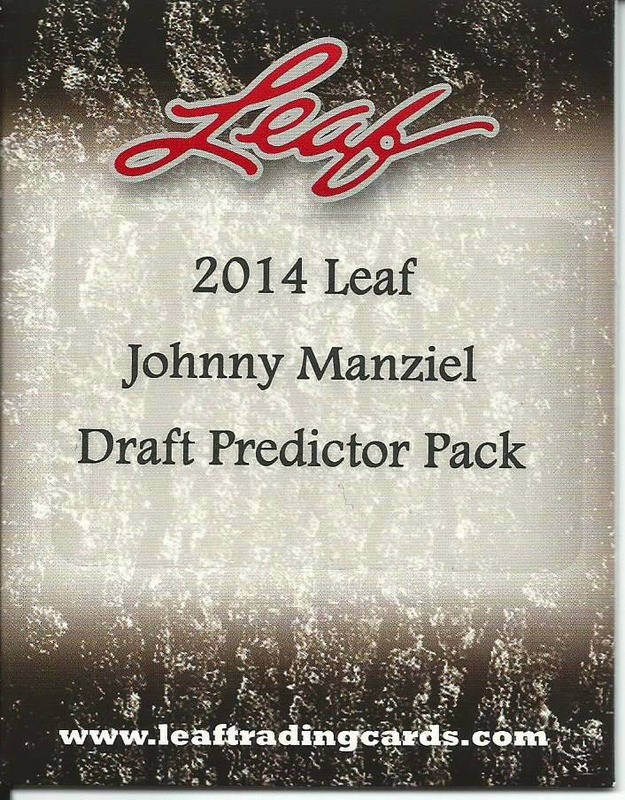 The packs, which run $9.99 (plus $2.99 s&h) are only available through Leaf’s eBay store, only contain one card. 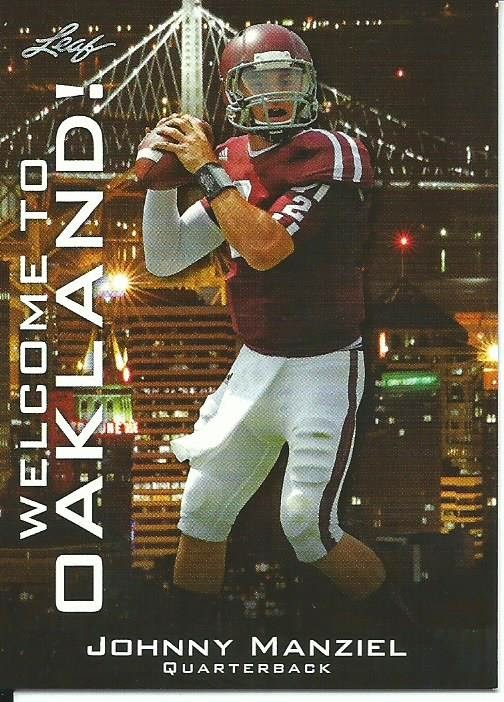 These cards feature Manziel (in Texas A&M uniform) pictured in front of a skyline related to each of the 32 NFL teams. There will only be 41 of each team’s card produced. 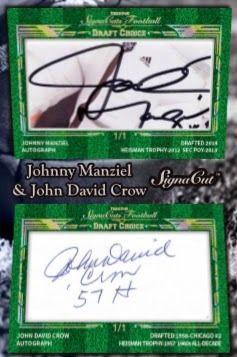 When you purchase a pack you get one of the cards randomly and after the NFL Draft, anyone with the card of the team that drafts Manziel can redeem the card for an autographed version that is limited to #/41. The entire set will be quite limited when you think about it, there will be 41 cards for each of the 32 teams which means only a total of 1,312 cards will be made. I am wondering what the plan is for the autographed versions, will they print an additional 41 to be signed and shipped or will the winners need to send in their card for the exchange. So far a little over 300 have been sold and as the draft gets closer I would expect that number to increase quickly and with the first orders estimated to be delivered as early as Thursday I would expect to see the Texans, Jaguars and Browns cards demanding a premium on the secondary market (with Oakland, Minnesota and maybe Tennessee getting a nice bump too). I purchased one earlier today and I am personally hoping for the Seahawks card, even though I know he will not be drafted by Seattle. With my luck I will probably get a team that already has a franchise QB like Denver or Green Bay. 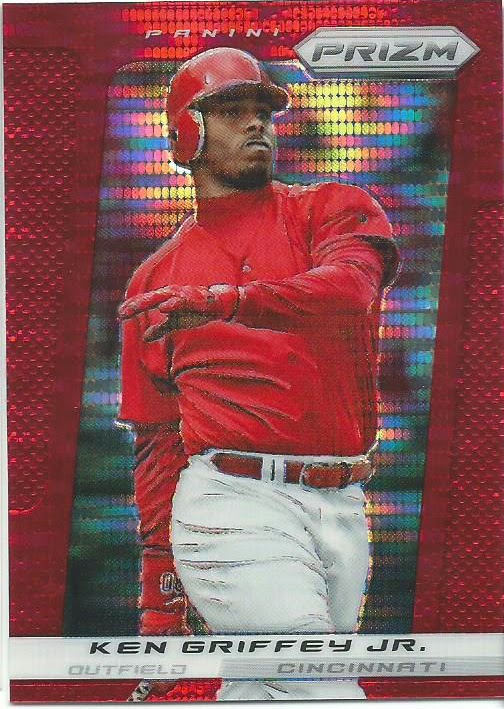 About 3 weeks ago a seller put up a 2002 Upper Deck Authentics Ken Griffey Jr (#162) reverse negative parallel as an error card and they set a reserve price. I would love to add one of these to my collection, you do not see them show up to often, and with a day left in the auction and the price sitting around $5 I put in a bid of $15.79 hoping that the reserve was like $12-15. I was bid up as the time ticked away and the auction ended with me having the final bid of $12.51. Slight problem, obviously the reserve was not less than that and the auction ended with no winner. I watched the seller for the next 2 weeks to see if they would put up the card again. I was hoping that he would see the final price and either set a BIN or a lower reserve. No luck, the card just wasn’t showing up and I stopped checking his auctions earlier last week (he sold mostly cheap electronics and home gadgets). Which turned out to be my bad decision. I found out he eventually put the card back up, no reserve on a 3-day auction. The damn thing sold for a little over $6 with free shipping. I know that losing out on the card was ultimately my fault for not watching the listings closer but damn, he could have easily contacted me after the first auction and I would have paid $15 and still have been happy. Now someone got a better deal, he lost out on an additional $10 and I lost an awesome card for my collection. I am bummed about this. Is There Still Room For CJ In The NFL? One of the big surprises of the off-season is the lack of interest in ex-Titan’s running back Chris Johnson. At 28-years old, he has six straight seasons over 1,000 yards including his amazing 2009 season when he topped 2,000 yards, a feat only 7 running backs have accomplished. You would think that teams would be lining up to work a deal with him but there are a couple of rumors that are beginning to spread that could be causing teams to hold back on trying to sign with CJ. According to a league source, reported by a number of outlets including CBS News and NBC News, Johnson is refusing to engage in any private try-outs for interested teams. Add this to his “Me First!” attitude, his previous ripping of his team and teammates and now the rumors that he hangs around gang bangers/bad elements (un-proven at this time that I know of) is a major concern for teams. At the age of 28 Johnson is coming up on the almost required running back retirement age of 30 years old. His rushing yards are dropping, his average per rush is falling and his touchdowns numbers are dropping. Has Chris Johnson cashed his final NFL paycheck? I don't think so, but I do think they will not be as large as he is hoping to get. In the hobby Chris Johnson has his collectors, but his personality has pushed many collectors away. Toss in his lack of a decent signature and there just does not seem to be a rush on his cards. His jersey cards can be found for a couple of dollars and his “CJ” autographs can be picked up for $20, if not less. This month’s Art Gallery display comes from the 2012 Topps Wacky Packages Old School 4 release. The artist is Mark Pingitore, a freelance animator who has worked with Topps on the Garbage Pail Kids and Wacky Packages lines. He is also a fellow Art Institute alumni so I gotta support the guy there too. Because Mark works almost exclusively with GPK and WP his illustrations has that goofy humor. This card is entitled “Sweating Bullets”, sadly even though the card is considered a one of a kind there are other Pingatore WP sketch cards that are almost exactly the same with slight differences, like one has the same image but sweating three bullets. This was another opportunity purchase, I was looking for Wacky Package Autographs and came across this sketch card for just a few dollars, I believe $2.99, so I tossed in a bid and won. I picked up this card last year, and I like it but with my current goal of controlled discretionary spending I would not have picked it up. Today is one of those days where writer’s block seems to be weighing heavily over me and nothing about sports cards is coming to me. So, I decided to revisit a post from February. 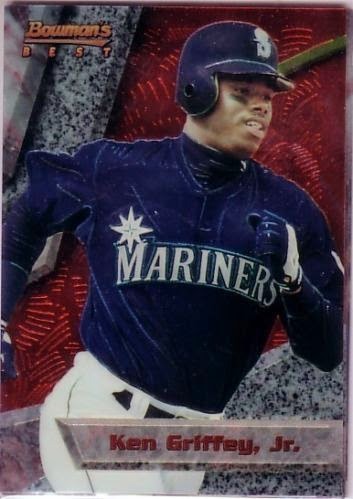 In mid-February I bought a 1995 Leaf Slideshow Ken Griffey Jr. 8A card that was graded. 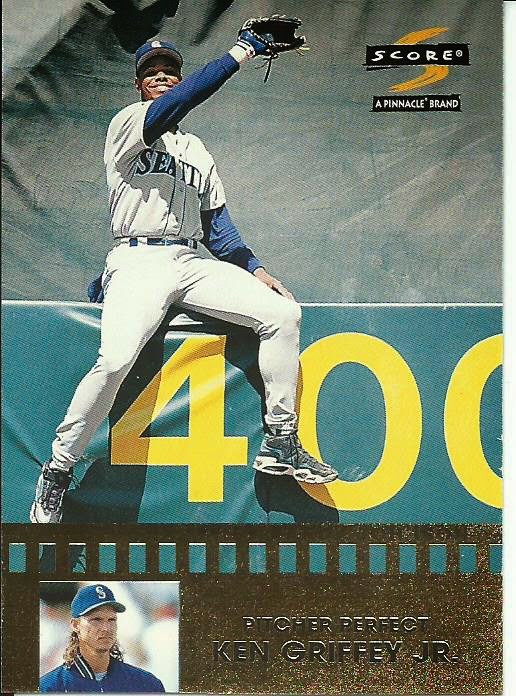 I had planned on removing the card from the slab, something the USPS helped me with, and all I needed was the slightly more rarer Griffey 8B card to make a complete Slideshow card. Well, 8A is now broken free from the slab and 8B has made it’s way in to my hands. 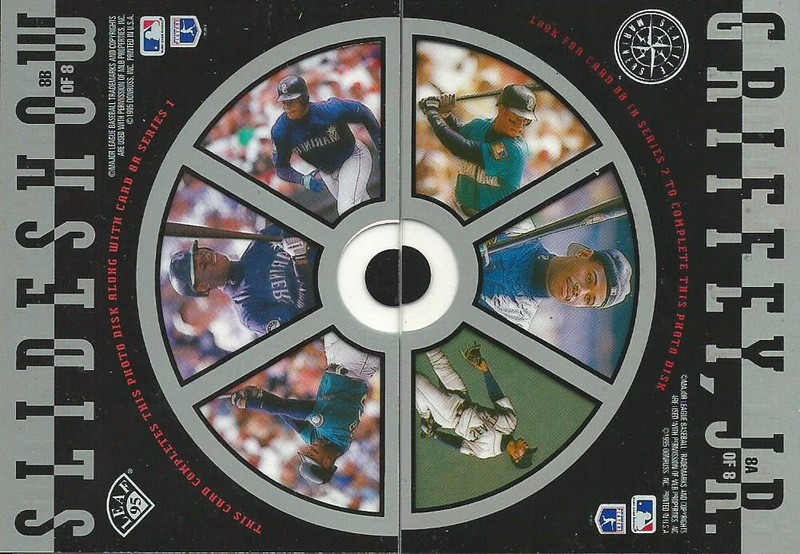 Here is the complete 1995 Leaf Slideshow Ken Griffey Jr,, isn’t it a beauty? This month’s VCoM comes from the T206 series. Most cards from the T206 release can be difficult to date because the set was inserted in to tobacco packs between 1909 and 1911, the King card though came from the initial 1909 release. 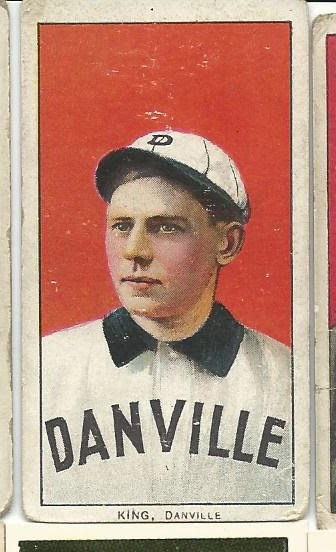 Frank King only played for the Danville Red Sox during the 1909 season. 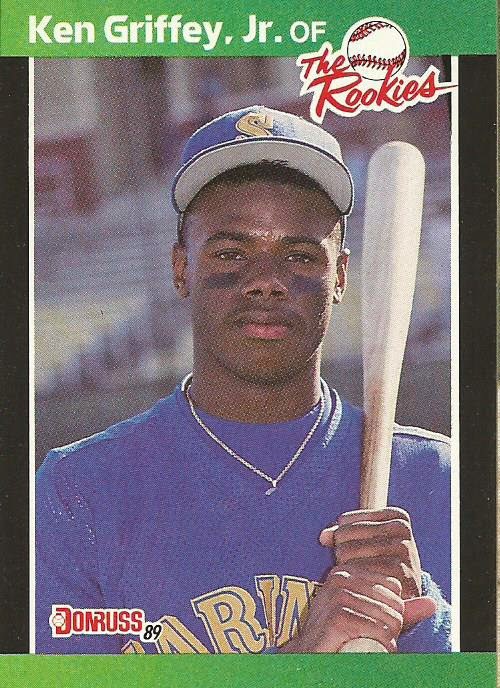 King was an outfielder that played 7 seasons, all in the minor leagues for 4 different teams. Saying he was a professional baseball player was being polite, his best season was in 1905 with the Savannah Pathfinders where he played 88 games and had .270 BA and 86 hits. He ended his career with a .222 BA and 487 hits. The good thing about the card is that it is in decent shape, the corners are rounded and the front surface is chipped but the color is still bright. Additionally, it is my only Old Mill back. The back is stained and cut off-center just as I like my Tobacco era cards. Saturday April 5, 2014 marked the 20th Anniversary of the death of Kurt Cobain, for Generation X-ers like me this was the day that music died (With apologies to Buddy Holly, Ritchie Valens and the Big Bopper). 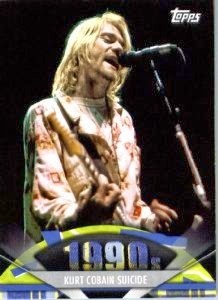 What bothers me is that Cobain is essentially ignored by sports card manufacturers. While Justin Bieber and One Direction are immortalized with entire sets musicians like Kurt Cobain are left to languish in the background. Kurt has only one card, besides oddball cards, to his checklist; 2011 Topps American Pie. A card marking his 1994 suicide. A couple of recent University of Arizona pickups arrived in my mailbox today. First up is Solomon Hill. 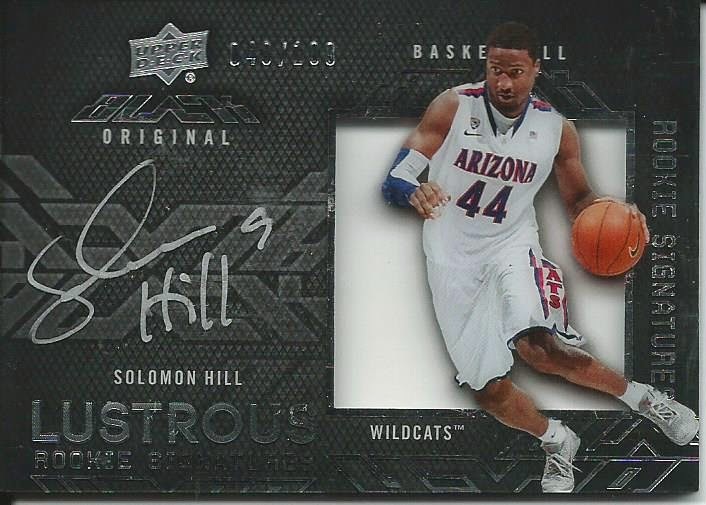 I love the 2013-14 Upper Deck Black Basketball release. The Lustrous rookie autograph cards are very cool, they are quite thick with on-card autographs. The player is placed over an acetate window, which highlights the player well. Hill was the 23rd pick by the Pacers in the 2013 NBA Draft but he is having trouble transitioning to the pro game. Coming out of Arizona he was being compared to Ron Artest and was hitting 42% of his 3-point shots but things are not going well in Indiana. He started in the D-League but was recalled by the Pacers and has since been averaging 6.8 minutes per game, 1.5 PPG and 1.3 RPG. His anemic play allowed me to pick up this card for a whopping $1.99. 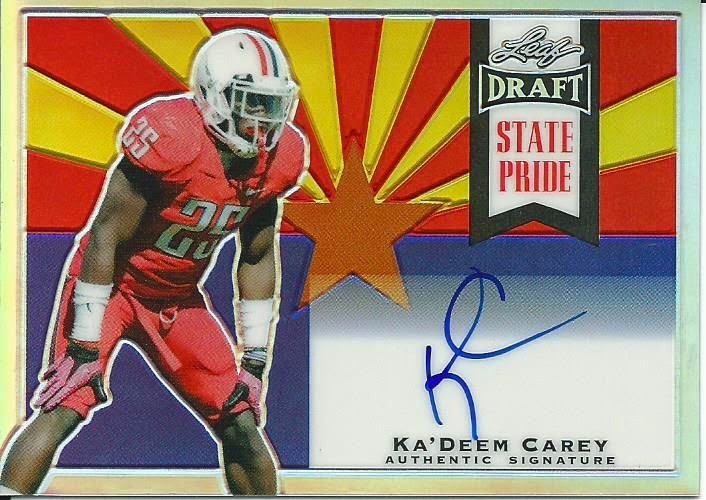 The other card is from the 2014 Leaf Metal Draft set, the State Pride Autograph cards highlight college players with the background displaying the state flag of where the players are from originally. I have been watching Ka’Deem Carey since his high school days, he attended the high school I went to when I lived in Tucson. He is rated as one of the best Running Backs in the 2014 NFL Draft so there is a good chance he will go in the Second Round. 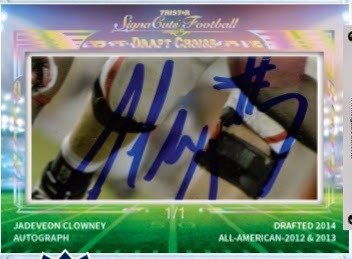 The huge downside to a neat card is his crappy signature, at least it is an on-card crappy signature. This card cost me a little over $6.00 shipped. The legacy of Jerry Rice is a mile long, he holds over a dozen records including most games by a position player (303 games), most receiving yards (22,895) and most TD receptions (197), he is a three-time Super Bowl Champion (including one Super Bowl MVP Award) and he is well respected by players and fans alike. After he left the 49ers following the 2000 season to the Raiders he seemed to have a resurgence, even returning to the Super Bowl with the Raiders. He spent 3 productive seasons in Oakland before growing disgruntle and requested a trade. Six games in to the 2004 season he was granted that trade and he headed to Seattle for the final 11 games of his career. After the 2004 season he signed a one-year deal with Denver but decided to retire instead, signing a one-day contract with the 49ers so he could retire properly. 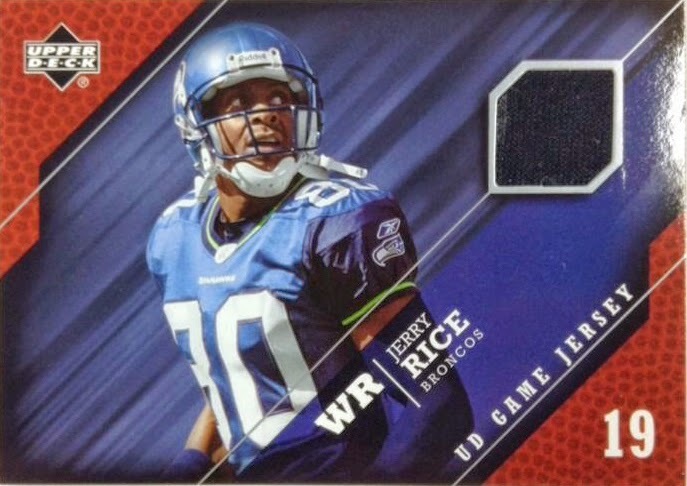 Because his time with the Seahawks was limited to only 11 games in 2004 I am pretty restricted on which Rice cards I want to add to my Seahawks personal collection. 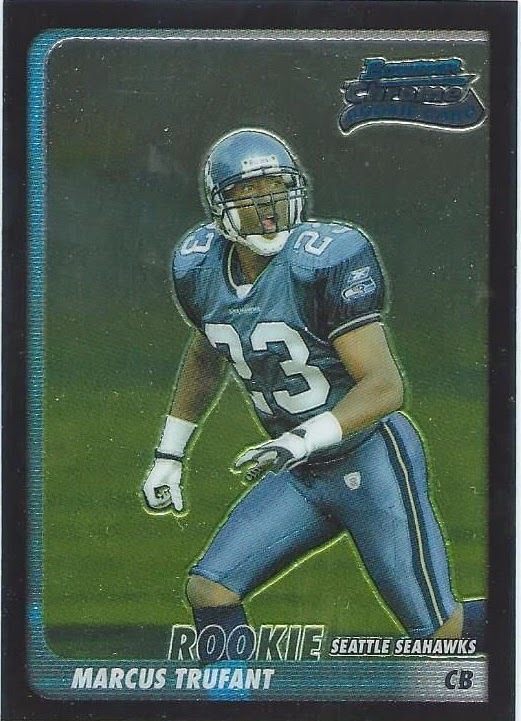 I came across this card, which I had seen before but paid no attention to it, which depicts him in his Seahawks uniform, lists him with the Broncos (including the Broncos logo on the back) and includes a relic from his Raiders days. 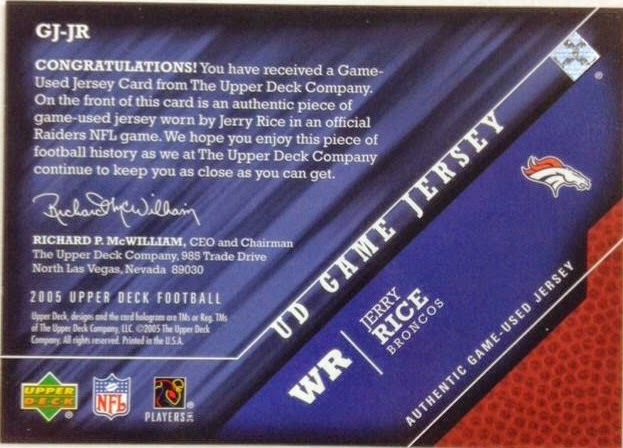 I am not sure, but this seems to be a fail by Upper Deck. Outside of a Jerry Rice super collector I don’t see people clamoring for this card because it doesn’t put him all with one team, the Seahawks, Broncos and Raiders are all represented here and most team collectors would bypass the card because of that, including me. What is your take on a card like this? There are badly designed sets and then there are sets that are hideously designed. TriStar has created the later with the upcoming franken-cuts disaster 2014 TriStar Signa Cuts Football Draft Choice Edition set for an early May release. Each box will run $60 and contains 1 cut signature card. TriStar apparently is trying to cash in on the 2014 NFL Draft class and they seem to have rushed in to this haphazardly and without a plan. The designs look like someone with a rudimentary understanding of MS Paint had full design control and someone with a pair of kid-friendly left handed scissors was in charge of procuring the cut signatures. Because they used different cuts the design is not uniform, there are cuts from photographs, 3x5 cards, programs, in-person signatures and from other cards. 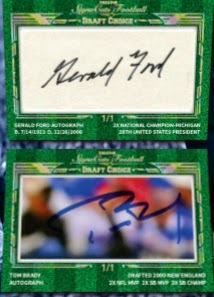 You gotta love the use of the 2012 Fleer Retro Rookie Sensations Russell Wilson cut signature. 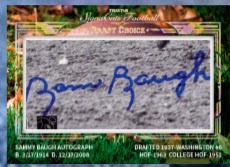 The only way to make a non-NFL sticker autographed card better is to cut it in half and toss it in a framed card. The only saving grace for the product is the randomly inserted Draft Tickets which can be exchanged for full sized items (autographed footballs and framed 8x10 photos) autographed items. Buying/Selling Unused Sticker Auto Sheets... Good or Bad? I belong to an MMA collector’s forum, Combat CardBoard, and about two weeks ago one of the members posted about purchasing two signed but unused autograph sheets. The sticker autographs, Frank Shamrock and Mario Sperry, were meant to be used for an Topps International Fight league set that was eventually cancelled when the IFL folded in 2008. Some of the fighters who signed returned their sticker sheets to the IFL league office, who in turn sent the sheets back to Topps. Eventually Topps used these signed stickers for their UFC sets. The sheets that did not get returned to Topps, for whatever reason, were sold off with the rest of the IFL’s assets when the league folded. This is where the Shamrock and Sperry sheets came from. A similar situation happened when Fleer closed the doors, you can find unused Fleer signature sheets selling in the $50-90 range. Which brings me to why I am posting today, I am torn on the idea of selling unused sticker autograph sheets. 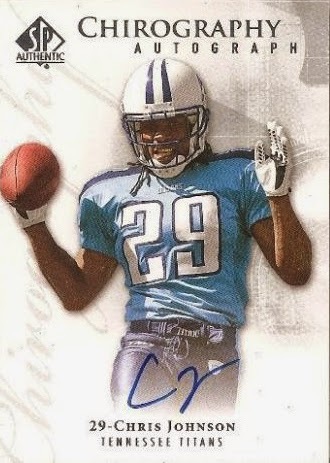 On the positive side a collector can add a signature of their favorite player to a card in their collection for a unique addition that they never intend to sell. Another cool use would be for a sketch card, an artist adds the sticker and now you have a custom sketch-agraph card. If some of sheets were more reasonable in price I would probably pick some up to make custom cards for friends. On the flip side, I am concerned that an unscrupulous dealer adds a sticker to a cheap base card, adds a handwritten “1/1” and now here is a super short-print buyback autograph selling for big bucks. 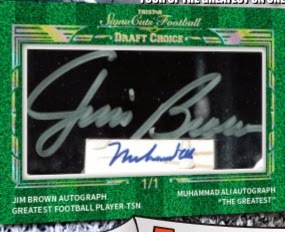 Given the autograph is authentic and the card is authentic and it is literally a buyback card but it is a card that was not released (with the autograph) by the company. At best it is a custom or ACEO card. I realize that these sticker autograph sheets are really not much different from buying cut signatures but the difference, in my eyes, is that someone can not just toss a cut signature on to a card and claim it was an unannounced buyback where if you toss an authentic Fleer sticker on a Fleer card some collectors may assume that it really was released by Fleer (or Topps). What is your input on unused signed autograph sheets like this Gary Payton sheet or this Rik Smits sheet being sold?